Theresa May has said she wants changes to the controversial backstop but suggested she is not seeking to remove it from her Brexit deal. In a speech in Belfast, the prime minister restated her “unshakeable” commitment to avoiding a hard border after Brexit. Mrs May said the backstop’s “potential indefinite nature” was the issue. However, Downing Street said the government was still considering alternatives. The backstop is an insurance policy designed to avoid a hard border “under all circumstances” between Northern Ireland and the Irish Republic after Brexit. 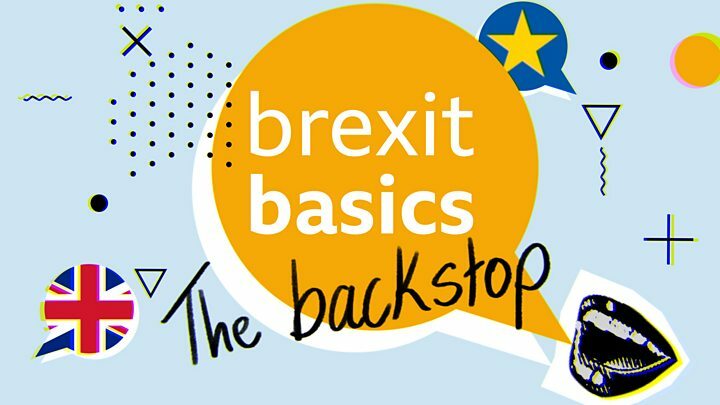 For some Brexit supporters in Mrs May’s party the message is simple – bin the backstop. She said: “There is no suggestion that we are not going to ensure in the future there is provision for this insurance policy… the backstop. Addressing an audience of business leaders in Belfast on Tuesday, Mrs May said she was “grateful” to firms and farming groups who supported the backstop in the withdrawal agreement. Ultimately, that deal was rejected by Parliament, and the prime minister has now moved to ask the EU to re-open the withdrawal agreement and allow legally-binding changes to be made to the backstop. Mrs May is due to meet the European Commission President Jean-Claude Juncker for talks in Brussels on Thursday. The Irish Prime Minister Leo Varadkar is to visit on Wednesday. The Democratic Unionist Party and Brexiteers believe the backstop could threaten the integrity of the union and could leave the UK stuck with EU rules if a trade deal is not agreed. 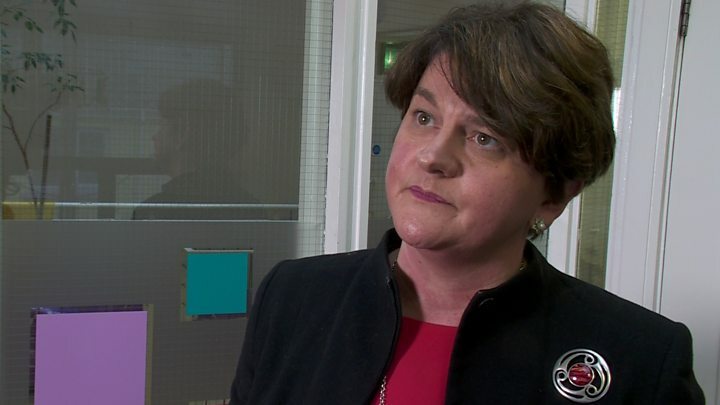 Earlier on Tuesday, DUP leader Arlene Foster said the “toxic backstop” remained the problem. The Republic of Ireland and EU have said there can be no renegotiation of the Brexit deal, or the backstop, leading to a rift in relations between the UK and the Irish government. On Tuesday, Mrs May said she wanted to strengthen the UK’s “unique” relationship with the Irish government – including the “tantalising possibility” of a joint UK-Irish bid for the football World Cup in 2030. 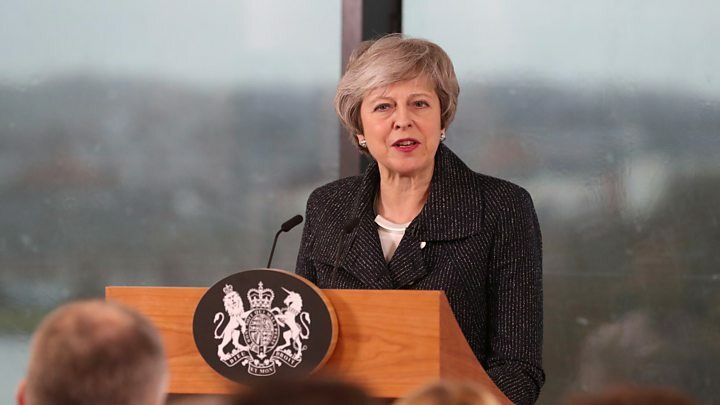 In a gesture towards nationalist concerns, the prime minister said she had asked the home secretary to review cases concerning Irish citizens in Northern Ireland who have had difficulties bringing in family members. However, Sinn Féin leader Michelle O’Neill said Mrs May’s visit came after she had “performed a major U-turn” over the backstop, an action she described as “an enormous act of bad faith”. “I heard nothing (from the prime minister) that would leave the community here to be in any way feeling in a better position than before her visit,” she added. The prime minister addressed this and said although she has said technology could play a part in managing the Irish border, it needs to work for the “particular circumstances” of Northern Ireland. Last July, Mrs May said no technology had been designed or implemented anywhere in the world yet to address the complexities of the Irish border. The EU’s chief negotiator, Michel Barnier, said there was “full agreement” that the withdrawal agreement “cannot be reopened”. On Monday, German Chancellor Angela Merkel said the EU would listen to proposals to solve the Irish border “riddle”, although they needed to hear how the UK wanted to do it. Tánaiste (Irish deputy prime minister) Simon Coveney said: “What Ireland is being asked to do by some in Westminster is to essentially do away with an agreed solution between the UK government and EU negotiators and to replace it with wishful thinking,” he said. DUP Brexit spokesperson Sammy Wilson said his party would not support any legal “codicil” to the withdrawal deal. Sinn Féin Brexit spokesperson Chris Hazzard said he did not think the prime minister had “any credibility at all”. But it did feel like somewhat of an olive branch to those who feel frustrated by Theresa May’s apparent U-turn on the backstop in recent weeks. The audience heard an appeal from Mrs May to strengthen Anglo-Irish relations, her “unshakable” commitment to peace in NI and a hat-tip to business leaders who backed her original deal. But the question of how the UK government intends to avoid a hard Irish border in its Brexit deal remains unanswered. Lord Trimble, a 1998 Nobel Peace prizewinner for his role in the Good Friday Agreement, said he was “exploring” the possibility of a legal challenge over claims the PM’s Brexit deal breaches the historic peace agreement between the Republic of Ireland and Northern Ireland. Mrs May’s deal “turns the Belfast Agreement on its head and does serious damage to it”, he told BBC Radio 4’s Today programme. What ‘alternative arrangements’ are there to the backstop? Northern Ireland has been without its executive since January 2017. Mrs May said that had not helped with the Brexit deadlock. She is working to restore it. She will meet Stormont’s five main parties on Wednesday to discuss the political impasse.